Big news today from the USHL! The league announced this afternoon that Lincoln Stars d-man Paul LaDue was named the 2012-13 USHL Defenseman of the Year. The United States Hockey League today announced that Paul LaDue of the Lincoln Stars has been named the 2012-13 USHL Defenseman of the Year as determined by a vote of USHL coaches and general managers. He becomes the first-ever Stars player to win the award. The 20-year-old played all but two of the 64 regular season games for the Stars and led all USHL defensemen in scoring with 49 points (12g, 37a). His 37 assists were the most among League blueliners and most by a Lincoln defenseman since Matt Bartkowski dished out 37 during the 2007-08 season. He also led League defensemen with 198 shots on goal. LaDue scored the most points by any defenseman in Stars history, finishing his career with 83 points (21g, 62a) in 118 regular season games. He moved into first place by recording his 70th career point on Valentine’s Day during a 6-5 shootout victory against Tri-City. He dished out an assist in the contest to surpass the 69 career points (23g, 46a) by Eli Vlaisavljevich (2004-06). 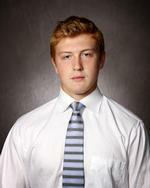 LaDue anchored a Lincoln defense unit that allowed the fifth fewest goals in the USHL this season (191). He posted a plus-27 rating, the sixth best mark by a League defenseman and tying for 16th overall. A dominant presence on the blueline that was counted on in all situations, he was also disciplined as he recorded just 20 penalty minutes throughout the season. LaDue was selected by the Los Angeles Kings in the sixth round (181st overall) of the 2012 NHL Draft following his rookie USHL season. He will return to his hometown of Grand Forks, North Dakota next season to begin his collegiate career at the University of North Dakota. "Paul Ladue was the heart and soul of a great Lincoln Stars team this past season," said USHL President and Commissioner Skip Prince. "His work in the offensive zone was League-leading – but there weren't too many goals scored against the Stars when he was on the ice, either. He'll be a great addition to the University of North Dakota next season, and the Los Angeles Kings made an excellent choice in drafting him last year. Congratulations and thanks to him for his stellar USHL career – and best wishes on his next steps." Very happy to see LaDue honored with such an award, but at the same time I'm not surprised. He's arguably the best defenseman that has ever put on a Lincoln Stars uniform. I've said it before on this blog and on Twitter, but Paul is easily one of the best players I've ever seen at the USHL level. He made everything look easy. So solid on both ends of the ice. I think a lot of fans her in Lincoln took for granted how good of a player Paul was because he was just so consistent game in and game out. It was as if it was expected. Special talent for sure. He will definitely be missed next season. You just don't replace a player like Kevin Roy or Paul LaDue. Best of luck to him next season at UND. There's no doubt in my mind we will be watching Paul play for the LA Kings in the NHL someday.